The Midwest Coalition for Human Rights, the University of Chicago Law School’s International Human Rights Clinic, and several cooperating organizations and individuals sent a “letter of allegation” last week to the Office of the High Commissioner on Human Rights for the United Nations, detailing what they allege are human rights violations that will occur if the Chicago Public Schools system closes 49 elementary schools, as its board of education planned and approved in May under the leadership of Chicago Mayor Rahm Emanuel, who served as President Barack Obama’s chief of staff before coming back to Chicago. You can read the actual letter on our site, here (PDF). The gist of the 21-page letter, which features 177 footnotes, is that the high commissioner’s office should intervene and stop the planned school closures in Chicago in order to prevent human rights abuses against mainly minority children. 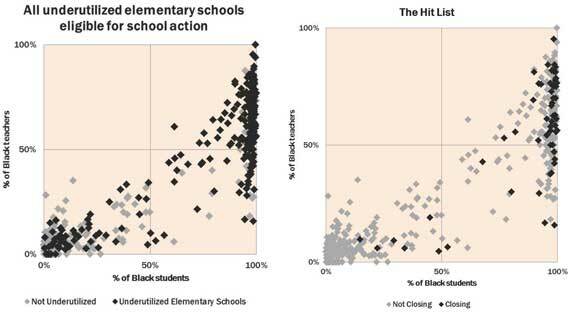 Using graphics to illustrate the claim, the letter’s authors told the UN that the closings will disproportionately affect African-American children. Shown above, at left, is a scatter plot of the Chicago public elementary schools the district would consider eligible for school action, the dark points representing those schools that are also “underutilized” or below capacity. Note in the graph at right that the vast majority of school closings are taking place at schools that have a high concentration of African-American students, and only a few schools with low concentrations of African-American students are being closed. “African American children are 42% of Chicago’s public school students, but represent 80% of the children who would be impacted by the school closings. In addition, 87% of the schools marked for closure are majority African American,” the letter asserts. This means that schools with “a majority African American population and teaching staff were ten times more likely to be closed or ‘turned around’ than schools with a minority African American student population and teaching staff,” according to an analysis by the Chicago Teachers Union cited in the report. Statistics and graphs are persuasive, but they are not likely to convince the high commissioner on human rights to issue any directives to the people of Chicago. I have repeatedly argued against their use in highly segregated systems, such as the Chicago Public Schools, to demonstrate any civil or human rights abuses. Any abuse must be a direct action that discriminates on the basis of race, not the racial impact of some race-neutral action. As a result, the inclusion of this graphic as the only graphic in the letter and its prominent use to illustrate the first main point of the argument, I think, weakens the letter. A stronger case should have been made by putting the more important points first. In April, NBC Chicago reported on a special needs student who had made good academic progress only after her mother sent her to a school that was able to accommodate her physical disability and provide for her academic and social development, here. Other parents and school officials have also expressed concern that changes in the school routine for students with special needs will hurt their development, as a report in the Chicago Sun-Times suggests. This negative impact, expected and predictable, that the closings and rapid change will have on students with special needs is what I think should have been a main thrust of the letter. More than the disparate racial impact, this discrimination constitutes a documented violation of human rights. That is, when a receiving school cannot provide for the needs of a special needs student, that child’s human rights have been violated. This type of scenario is being planned just too frequently in Chicago, and it needs to be stopped. Several reports (e.g., here) can be read of autistic children, for example, who were part of normal classrooms for at least part of their day but who wouldn’t have access to programs that provide interaction with mainstream students at their new schools. The letter also notes that class sizes will increase and most students will not move to better schools. I don’t think it’s the place of the UN high commissioner to evaluate the quality of education in the US, since the government isn’t explicitly denying anyone access to classrooms or schools. Furthermore, there are too many people who deny any connection of class size to “quality” for the high commissioner to weigh in. Data are still inconclusive, as this report in the New York Times shows, mainly because there has been only one controlled study in the last quarter century that examined the effects of varying the class size. Although that study, known as Project STAR, concluded that lower class sizes produce lasting gains, especially for minority students, the study hasn’t been replicated. We simply know better than to trust a single source. And if we can’t be conclusive about class size, imagine how hard it would be to solicit an opinion from the high commissioner about what exactly constitutes a “better” school. “Children traveling to school through certain areas and children attending new schools in hostile neighborhoods will face a significant risk of violence,” one of the letter’s headlines declares. Chicago has more homicides of people under 21 than any other city in America, and those homicides are concentrated in minority communities on the city’s south, west, and southwest sides, the Chicago Reporter said. “Parts of Chicago are gang-controlled and when individuals, including children, from one neighborhood travel to another neighborhood (or even from one block to another block), they are at risk even if they are not affiliated with any gang,” the letter’s authors claim. Governments are required, in the Convention on the Rights of the Child (Nov 20, 1989, 1577 UNTS), to “take all appropriate legislative, administrative, social and educational measures to protect the child from all forms of physical or mental violence, injury or abuse, neglect or negligent treatment, maltreatment or exploitation.” This has been interpreted to mean that schools have to do what they can to protect students from random violence. By closing schools and forcing students to travel greater distances, across gang-turf lines, the district seems to be taking a step in the opposite direction. “The school closings jeopardize the right of children to be free from violence, their right to life, and right to accessible education,” the letter concludes in this section. These are all rights the UN is supposed to protect, and it must act in this case. The right to be free from violence and the right to life are obviously harmed by the closings, but the right to an accessible education may be a little more remote. But consider this: As students are subjected to a greater risk of violence, they are more likely not to attend schools that force them to travel through areas that would be hostile to them. This reduction in attendance makes it more likely that students will drop out of school or fail to master the learning objectives schools are trying to teach. That’s why the closings hinder the right to an accessible education; it’s got nothing to do with class sizes. The abuse of this human right in Chicago is staggering. It completely blows my mind how deaf public officials have been throughout the closure process. They have repeatedly ignored and even deliberately silenced the voice of the public, especially that of children. As recently as last week, people from Chicago Students Organizing to Save our Schools spoke at a board of education meeting. When their demands were ignored, they formed a human chain and began chanting. They were kicked out by security. “The manner in which decisions regarding the school closures were made denied parents, community members, and teachers the ability to participate in an important public policy decision,” the letter’s authors told the UN high commissioner. We have also documented the failure of school officials to listen to parents and other community members regarding the closing of schools, here: “Chicago residents should be embarrassed at the process used by the school district at what should have been public hearings and a voice of democracy. Instead, the hearings were nothing more than venting sessions that CPS officials and police commanders had to sit through long enough to make an appearance for the record,” I wrote. Finally, the letter takes a cursory look at the CPS budget and concludes that even though the “right to education” can be limited by governments based on available resources, no governmental body can deny the right to life or freedom from violence based on a lack of funding. If the city follows UN treaties, it cannot treat students at one school differently from how it treats those at another school, relative to the right to live free of violence. This is why I feel the UN high commissioner should intervene: either the laws of the US are inadequate to stop the human rights and children’s rights abuses or the city and school board of Chicago don’t think they have to follow the laws.